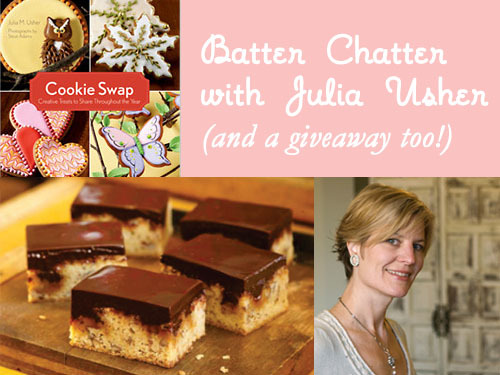 Batter Chatter: Interview with Julia Usher, Author of Cookie Swap, With a Giveaway! Let's talk about cookies. 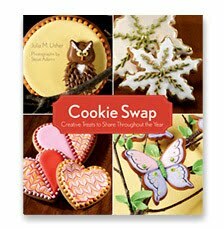 More specifically, let's talk about cookie swaps, a tradition big in the 60's--and one that Julia M. Usher, author of Cookie Swap: Creative Treats to Share Throughout the Year , says is making a comeback in a big way. Curious? Here's the CakeSpy interview...with a bonus recipe for one of Julia's favorite recipes in the book...as well as a giveaway to win a copy! 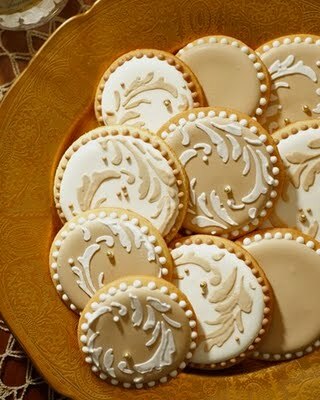 CakeSpy: Important question: what was the last cookie you ate? Julia Usher: The Brown(ie) Noser--we had some left over from a signing I did on Saturday. I had it for breakfast the next morning! CS: So, it was through a magazine that your book came to be--how did that happen? JU: What happened was that I had a bakery for 7 years; I closed it a few years ago. I thought that what might better suit me was to write books and develop the creative content without being tied to the bakery and production. So I closed the shop and wrote a proposal. And I got an agent, which is particularly key in thecookbook arena, because it's very hard to get access to publishers without one. My initial proposal was actually for a cake book; after going through 40 possible agents and narrowing it down to 4, I ended up choosing an agent out of Cambridge, MA who was very reasonable -- she began pitching the cake book, and we kept hearing the concept was too big to sell in this marketplace--but she had seen the article I had written for St. Louis at home, and asked if we could craft a book around cookies and cookie swaps: I said I'm sure I could do that, and wrote another proposal. We ended up selling both, but we decided to go forward with one to start. CS: How did it go from a book proposal to an actual book? Did it change a lot? JU: So, the book proposal did include a sample chapter, but really, it was more of a business plan, with audience, competition, analysis, and all of that. There were some changes with the page count and amount of photographs--which were 2-3 times more than originally contracted. We ended up having to cut the content, change the size of the pages and shift from hardcover to paperback, but ultimately we kept the book at the same price point as initially hoped for. All in all though, everything I wanted to be there was there--if slightly abbreviated. I did take on some moonlighting during the proposal process because I was getting bummed about because it was taking a long time to sell the book, and I felt like I needed the validation of making money. 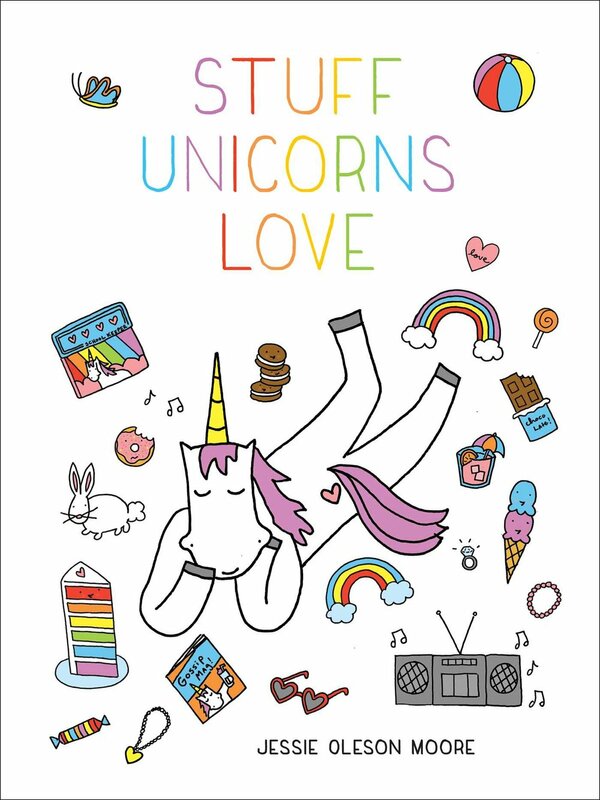 CS: It seems that you're currently embarking on a bit of a guerilla marketing scheme to promote your book. Can you tell me more? JU: I have about 100 stops nationwide; about 10 major metro areas. It's something I put together on my own dime; I'm looking to cover a chunk of the cost with cooking classes and lining up some sponsorships. The reality of the publishing industry is that there are less and less tours; when you sign a contract you know what kind of tour and support you are going to get, so I walked into this agreement knowing that if I wanted to do any additional PR, I would have to do it myself. For my first book, I wanted to make sure I had thrown everything I had at it and hopefully launch another one, even if it means I don't make much money off of this first one; hopefully it will command a bigger advance and more marketing on the second project. CS: How much attention have you been giving to online media--blogs, etc? JU: Quite a bit--that is how I reached you! The way I approached marketing was first by approaching national magazines, and then after that, I tackled every lead sequentially, planning stops at independent booksellers for my tour--I was prohibited from calling any big chains--then after that I approached local media--newspapers, radio, TV--and then I started approaching online channels because I realized the turn time was shorter; I approached high traffic websites and food blogs. CS: You started out as an engineer and business consultant--how has this played into your current role as baker/cookbook writer/food stylist? JU: I always bakd and always had a strong interest, but I didn't express that professionally; in college, there was more of a cachet to going into the business side of things where you made more money. I became burned out on the consultant position when I got transferred to an office in Boston where I felt I didn't fit as well. That precipitated the change in my life: could there be a way to marry what I loved avocationally with the rest of my life? In terms of past jobs informing baking, not really in terms of artistry or technical or construction aspects, but I do feel that what factors in is a business background -- I am fortunate that I am able to maintain the creative end without getting flaky...about obligations. CS: Any words of advice for people who want to make a change? JU: Be realistic. Prepare yourself--financially, of course--walking into any kind of food business you have to walk in with a sense of the financial reality. But then, there's no sense in working at something you don't love, so look at it realistically but don't let that bind you, because there are always creative ways to make things happen. CS: OK, on to the cookies! Cookie Swaps date back to 1963...so does this mean that cookie swaps are a bit of nostalgia prime for a comeback? JU: I think it plays into where we are as a society...people are eating on the run, without family, without sharing, without talking...and I think that things go in cycles and that this economy will bring us back to baking at home--as well as things like canning and preserving, things we did a lot of growing up that virtually disappeared. They take a bit more time but they bring people together over food...and I think that we are beginning to see that again. CS: You say that the cupcake has basked in the limelight for too long...tell me more! JU: The cupcake wedding cake was just starting when I closed my bakery. I do enjoy cupcakes, but I think that cookies are less intimidating for some people to make than cupcakes. 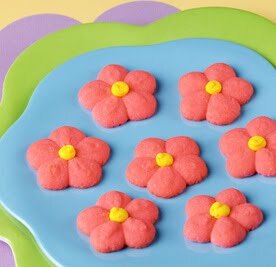 Some of the cookies are fanciful and I don't want to diminish that, but I do feel as if the trending toward the kitchen will make people feel as if they can spend the extra time and decorate the cookies as shown in the book...or they can just bake them and have them as they are! CakeSpy Note: although the time spent is worth it; the cookies in the book really are gorgeous! CS: Springlerle: let's talk about it. Any tips for a beginner? JU: Ideally, the cookie is slightly crusty outside and pillowy on the interior, but it gets harder as it ages. It's a very basic dough in terms of mixing and preparation; the part that is harder is getting a fine imprint and having them look lovely. With that, it will take a little trial and error--to get a good imprint, you may need a little extra flour. You need to generously dust them and there is an art to rolling it out; regular cookie cutter cookies I will roll 1/8 inch thick, these I will roll a bit thicker to make sure I get a good imprint. Once pressed, I will let dry at room temperature overnight or for a few hours before baking; the pattern will set a bit more. I prefer working with individual molds rather than a roller. It takes longer, but I feel as if it offers more control in the impression than using a roller. House on the Hill is a great resource--there really are pins and molds for every occasion. CS: What are some of your favorite cookies in the book? JU: I like gooey and rich, so that guides my responses. I have two: one is the Brandied Cherry Chocolate Sin Cookies; it's a globby type of batter, very simple but they have a lot of give with the bake time and are very yummy and easy. The other one I really like is the Brown(ie) Noser, which I like to glaze with a bit of ganache on top. Of course the sugar cookies (which I grew up baking with my mom; nostalgia definitely plays into baking. CS: Back to the Brownie Noser. It brings up a serious point--are brownies really cookies? JU: To me, they are fundamentally cookies: the have the same fundamental ingredients, they're just flat and transportable; they could just be shaped into conventional cookies; in a way, it's kind of a shortcut, where you just make one big cut at the end (unless you're layering lots of stuff). And you don't have to worry about as many multiple cookie sheets. Want more? You can connect with Julia via her website or Twitter feed! UPDATE: The winner! Chosen at random, Elaine takes the cake (er, cookie!) on this one!